There’s something so elegant about an omelet. 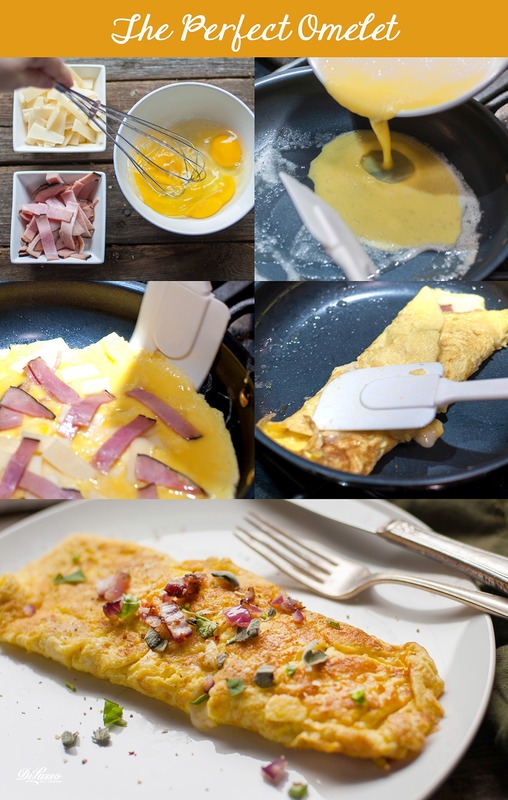 And making the perfect omelet is so much more than just beating eggs and pouring them in a pan. There’s a bit of an art to it—so it might take a few practice sessions to get it just right. Here we’ll walk you through the method for making an omelet that serves one. You’ll have the best success with the right pan—a skillet specifically shaped and sized for omelet-making is ideal, but any skillet will do as long as it’s nonstick. Have eggs at room temperature for best results, and have your choice of toppings—no more than two or three per omelet—at the ready. Suggestions: Cracked Black Pepper Turkey and Pepper Jack Cheese, Prosciutto and Provolone, Honey Ham and Smoked Gouda or Dry Salami and Mozzarella. But any meat/cheese combination will do. Get creative! Crack 3 eggs into a bowl and add a splash of water (the water helps steam the omelet, making it extra light and fluffy); whisk to blend. Heat pan to medium-high. Add butter (preferably unsalted) to coat the bottom of the pan. The pan is ready when the butter stops foaming. Pour eggs into pan and let edges set. "Pull” eggs from all sides toward the middle of the pan, letting liquid eggs flow under the egg that’s already set. Fold one side toward the center, about 1/3 of the way. Tilt the pan so that the other side folds toward the center, and then turn it again so that the omelet slides onto your plate seam-side down. Add salt and pepper to taste; you may also top with finely chopped fresh chives, parsley, and/or chervil. While we usually think of breakfast when we think of omelets, they’re a great brunch, lunch, or easy dinner choice as well.